I'm craving some serious sun right now. The cold weather is fun and all, but what I really want is the sun warming my skin…even if it's only for a few days. Every night before bed, I bring this up to Anguel – hoping that he'll wake me up the next morning, excitedly clutching our laptop because he found us a last minute vacation deal. That hasn’t happened. Instead he's just (accurately) identified that this "need" of mine seems to sprout up every February. Hmmm. I didn't know I was that predictable. For years we've talked about travelling Greece together – I've always wanted to go, for many reasons including sun + beaches + food. Since the actual trip is nowhere near scheduled (this year? next year? ), I've been getting my fix via some local Greek food instead. There’s one dish at our nearby Greek restaurant that I particularly fell in love with. A tomato chickpea casserole. After ordering the same thing for a third time straight, I resolved to try and make it at home. Because if there's one thing I know, it’s that chickpeas are dirt cheap and damn delicious. I absolutely love dinners like these. In 45 minutes we're sitting down to a cozy, warming dish of seasoned chickpeas and a flavorful tomato sauce. With spinach and crumbled feta of course. This dish is comforting and filling, without being overly heavy. It pairs well with a side salad or some soft pita for dipping. That said, it’s satisfying enough that it doesn’t need any supporting actors – sort of like Tom Hanks in Castaway. I've recently started cooking my own beans from scratch, and it's been a revelation – mainly for my taste buds, but also for my bank account. Dried beans are crazy cheap to buy – literally a fraction of what you'd pay for canned – and I much prefer the texture of the home cooked version. Let me give it to you straight though: it does require planning. Dried beans should be soaked (overnight if possible) and depending on the bean, could take ~1-1 1/2 hours to cook. So, it's not usually a last minute thing. Personally, I find it most practical to cook up a big batch at the beginning of the week. The cooked beans store well in the fridge; and if you make a particularly big batch, you can also pop the extras in the freezer. And, on weeks where bean prep just wasn’t meant to be, then I'll reach for the can…because sometimes you just need some legumes, STAT. For this recipe you’ll need 3 cups of cooked chickpeas. If you’re going for canned, our favorite brand is Eden Organic. They're one of the few brands I've come across in Canada that clearly label their cans "BPA free". They also prepare their beans with a bit of kombu (seaweed) which helps with both digestion and enhancing flavor. You can easily do this at home too – just add a small piece of kombu to the cooking water. You won't be able to taste it in the cooked beans (you'll strain it out after cooking), but you should notice an improvement in digestion and taste! The fresh spinach adds extra texture the dish, and is chock full of nutrients. A little squirt of lemon brings a refreshing citrus-y note to tie things together. That and it can help you better absorb the iron from the spinach (double win). While it might seem like there's a fair bit of spices and seasonings in the tomato broth, but they really do go a long way to infusing the dish with extra flavor. Especially since you're cooking the tomatoes in a relatively short period of time (some sauces take hours!) – you'll find that a few spices can really go a long way. And, I'll bet you have most (if not all) in your spice drawer. The final step for the dish is to place it under the broiler. 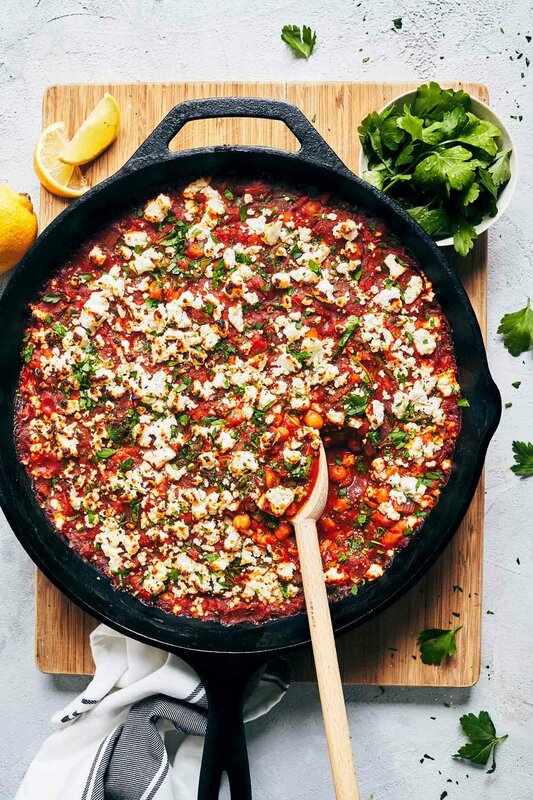 The sauce will begin to bubble and the creamy feta cheese will start to turn golden brown. For a vegan option, simply skip the feta. Preheat the oven to broil. Heat a large (12") skillet over medium-high heat (see note below). Add oil and hot, add diced onion. Cook for 5 minutes until onions are softened and translucent. Reduce heat to medium, add garlic and cook for another 2 minutes. Pour in tomatoes, vegetable stock, bay leaves, oregano, cloves, allspice and cayenne. Stir to mix. Cover with a lid. Bring to a boil and cook for 20 minutes. Remove lid from pot and give the mixture a good stir. Add the cooked chickpeas and cook (uncovered) for about 10-15 minutes – until the liquid has reduced by one third. Add the spinach and stir until it just begins to wilt. Finish seasoning the tomato and chickpea mixture by added coconut sugar, olive oil and lemon juice to round out the flavors. Add salt and pepper to taste. Remove bay leaves. Crumble the feta on top of the chickpeas. Place in the oven and broil until the sauce is slightly bubbling and the cheese is golden brown (~5 minutes). Garnish with fresh chopped parsley if desired. -If your skillet is notably smaller, opt for an oven-safe pot instead. Alternatively, if you can also use a regular pot and divvy up the casserole into smaller oven-safe dishes for the final step in the oven. -*If using coconut oil, you may wish to opt for deodorized coconut oil. It doesn't impart the same coconut scent. -**Strained tomatoes are usually sold in tall glass jars. They may also be labeled as "Passata". You can substitute with crushed tomatoes (not tomato paste or tomato sauce). -***The texture of home cooked chickpeas is far superior to canned – and recommended in this recipe since chickpeas are the star of the show! To cook chickpeas from scratch, soak 1 cup dried chickpeas overnight. Rinse thoroughly. Add beans to a large pot and fill with water, until the waterline is 2-3 inches above the beans. Cook for ~1 1/2 hours until the beans are tender. Add 1 tsp. salt and let sit for 15-20 minutes. Rinse beans in cool water and strain until dry. Alternatively, you could substitute 3 cups cooked chickpeas for 2 (15 oz / 425 g) cans of chickpeas (strained and rinsed well). -****The sugar helps balance out the acidity in the tomatoes. Feel free to omit if you prefer.